I have been trying to work more salads and veggies into our daily meals. 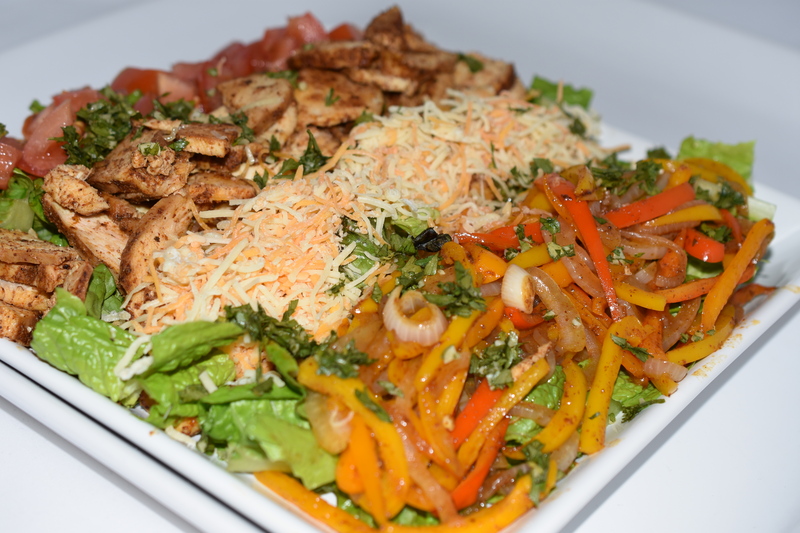 This salad adds lots of flavors that you would get if you ate the traditional fajitas. Melt bacon fat in a large skillet over medium heat; add onion, peppers and smokey southwestern seasoning. Cook until veggies are tender, then remove and set aside. Add chicken to skillet and cook until chicken is heated through. Remove and set aside to plate. To make the lime vinaigrette squeeze juice of 1 lime into a mason jar; add olive oil and a pinch of sea salt and pepper. Cover jar with lid, and shake. To assemble the salad; Layer lettuce as the base of the salad. Then layer peppers and onions in a row; continue with the cheese blend, chicken, and tomatoes. Top with lime gremolata and lime vinaigrette. Serve. Eat. Enjoy.